Pie and I have not always been the best of friends. After my last relative success, I decided that the stress to fun ratio for pie was too high. So I faced the fact that it's my weak spot and I gave up trying. I don't regret a lot in my life, but that was indeed a poor decision. Pie is a really interesting concept. There are a million different ways to vary the preparation: one crust or 2, the type of fat used in the crust, and the type of thickener and fruit(s) used in the filling, for example. All resulting in relatively similar final products. I've come to realize that making a good pie is about finding the right combination of all these variables in any given situation, which takes a lot of patience. I had assumed that because I made a few pies that I wasn't happy with in the past, that I wasn't good at pie, but that's not true at all. I just had to try. A lot. I've been hearing a lot about pie this summer. Maybe I'm just more aware of it this year, but everywhere I turn-- blogs, podcasts, restaurants-- all have pie on the brain. The biggest thing I've learned from all of this is that there's no "right" way to make pie. It all comes down to personal preference and practice, practice, practice. Armed with this knowledge and surrounded by gorgeous California fruit, I was overcome with the burning desire to make a peach pie. So I summoned all my courage and did just that. For the top crust, I used a technique I saw in a magazine once: use a circular cookie cutter to cut rounds of dough and arrange them in concentric circles around the top of the pie. This trick is key if you're a total klutz like me when it comes to handling and shaping pie dough. I used quick-cooking tapioca as the thickener, which worked great but left little tapioca pearls inside the pie which was a bit strange. Next time I'll use tapioca flour. This was most definitely the tastiest and best-looking pie I've made so far. I'm hooked now. Can't wait to try again, and again, and again. It's almost apple time! 1. To make the first crust, combine the half of the flour, half the sugar and half the salt in the bowl of a stand mixer fitted with the paddle attachment. Mix briefly to blend. Add in half of the butter pieces and mix on medium-low speed to cut the butter into the flour until the mixture resembles coarse sand and the largest butter pieces are not much bigger than peas. Mix in half of the cold water on low speed just until the dough comes together. 3. Repeat the process with the remaining ingredients (except the egg, you'll use that later) to make the 2nd crust. While the dough is chilling, make the pie filling. 2. Peel the peaches: Bring a pot of water to a boil and drop the peaches into it, a couple at a time, for 10-30 seconds, until the skin begins to loosen. Plunge into a bowl of ice water. Slip the skins off, using a paring knife to ease the process. Pit, slice, and toss with the lime juice. 3. Mix together the dry ingredients and toss the peaches with this mixture. 1. Remove one of the crusts from the refrigerator. Working quickly, roll out the dough on a well-floured surface, flouring more as needed to prevent the dough from sticking as you work. When the dough is large enough to fit a 9-inch pie dish, transfer the crust to the dish. Use whichever method feels the most comfortable to transfer the dough: slide it, drape it over your rolling pin, pick it up and drop it. Just make sure it's intact when it arrives! 2. Shape or flute the edges of the crust if you'd like. 3. 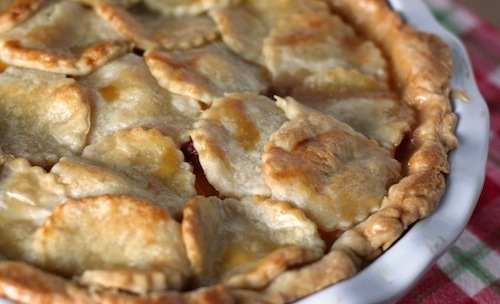 Drain any excess juice that has collected from your peaches, then pour the peach mixture on top of the pie crust. Stud the peaches evenly with the small butter bits. 4. Remove the other crust from the refrigerator and roll it out. Don't worry about making it perfectly round, we're going to butcher this one. Take a cookie cutter (the one I used was 2 inches round with fluted edges) and cut out circles of dough. Place a circle in the middle and build a spiral of circles until the whole pie is covered. You may need to gather dough scraps and re-roll the crust to get enough. 5. Lightly beat an egg with a splash of water. Using a pastry brush, paint the entire crust with egg wash. Sprinkle with granulated or turbinado sugar if desired. 6. If you have a pie crust shield, place it on your pie now. If not, go buy one! Kidding. Make a makeshift crust shield using aluminum foil and place it on the pie. 7. Bake the pie at 450F for 10 minutes. Reduce the heat to 350 and bake until golden brown, 40-50 minutes more. Do not underbake. 8. Remove pie from oven and cool on a wire rack. Serve warm or at room temperature with vanilla ice cream, if desired. Oh wow this KILLS me. It looks delicious. I have never been one for pies...I prefer chocolate cake :) EXCEPT peach pie. In Spokane WA (where I used to live) they would have a peach festival and I would go pick tons and make peach pie. 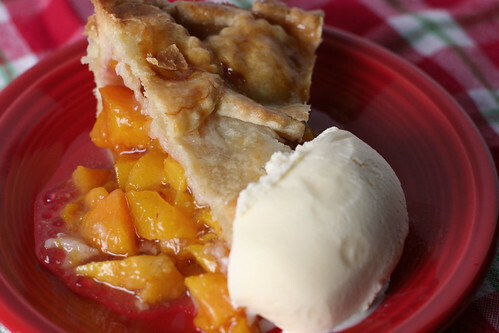 I would kill for those peaches right now to try on this recipe. It is most definitely a beautiful pie. I've heard of using tapioca to thicken pie filling before but have never tried it. I don't think I'd like finding the pearls in my pie, so it's good to know that happens. I'll have to see if I can find tapioca flour. I love the way you did the dough circles on top. I totally agree about the stress to fun ratio of pie! But yours came out beautifully! Oh - and cornstarch works very well as a thickener. I can't get over how gorgeous the top of that pie is! I need to attempt that sometime! I made this pie last summer, but forgot to post about it. I have been craving peach pie lately now that peaches are in season so I visited to remind myself of the recipe. Realized my error in not posting and so here I am. This was a great recipe. I found and used tapioca flour and it was a great thickener. The lime juice kept the filling from being a complete think, too-sweet mess, and we used the apple pie spice which was the perfect compliment for the peaches. I don't know if I will ever make a pie crust another way again. I had a small star shaped cookie cutter and it resulted in the most festive pie crust and super, super easy. Everyone I mentione this method too say, "That sounds time-consuming!" Apparently they have never spent time trying to evenly roll out and place a pic crust on a pie without holes, tearing, or ending up with a massive mess when you mis-place the top crust, try to rectify, and end up with the filling all over. This method, however, was a piece of cake. Just roll, cut and place. Thanks for the recipe and the idea, Amy! !